Ted Bundy was convicted of Aggravated Kidnapping. But was he violent? In March 1976, Ted Bundy was convicted of the aggravated kidnapping of a young woman near Salt Lake City, Utah. Bundy had not been accused or convicted of any violent crime except this one. No one knew then how many women Bundy had murdered, and many thought him incapable of doing so. Dr. Al Carlisle was part of the 90-Day Diagnostic team at the Utah State Prison when Bundy was sent there after the trial. 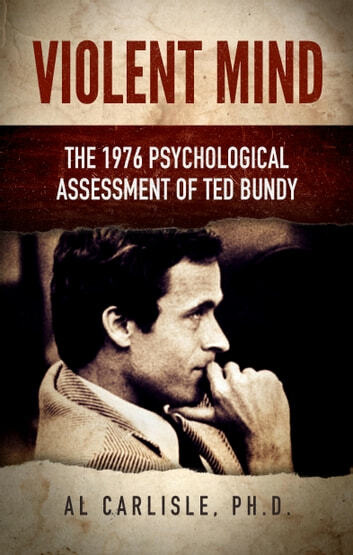 Dr. Carlisle’s assignment was specific: Determine to the best of his ability, without being biased by any of the reports previously done, whether Ted Bundy had a violent personality. The judge would use this information in deciding whether Bundy should serve time or be released on probation. In Violent Mind: The 1976 Psychological Assessment of Ted Bundy,Dr. Carlisle takes the reader step by step through this previously-unpublished evaluation process, and shows how he concluded that Bundy had the capacity to commit aggravated kidnapping, and perhaps much worse. Many books have been written about Bundy, but rarely have we had the opportunity to understand the inner workings of his mind. Now, Dr. Al Carlisle shares the step-by-step psychological assessment process regarding how he determined that Bundy was a very violent person and would likely continue to kill victims if he was set free. The assessments that led to Bundy’s incarceration are being published for the first time. Violent Mind contains never-before-seen interviews with Ted Bundy and those who knew him, including a letter Bundy wrote to Dr. Carlisle that has been locked away for more than 40 years.